Some people enjoy doing favors for others, since they feel better helping them. For some this can seem like a waste of energy, and they much prefer to have more of a reason for doing something for someone else. 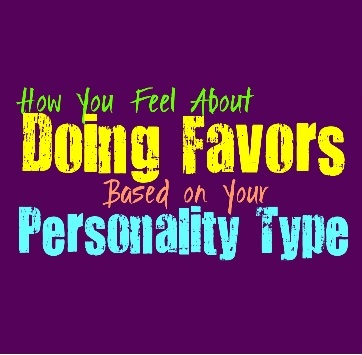 Here is how you feel about doing favors, based on your personality type. INFJs don’t mind doing favors, especially for their loved ones. They are often very helpful people who sometimes do favors just for the sake of helping someone. INFJs care about people and are sensitive to their emotions, this often makes it more natural for them to do favors when someone is in need. They don’t mind being someone who does favors for others, and actually enjoy being someone who can help people improve their situations. ENFJs find themselves doing favors for people fairly often, pretty much every day of their lives is spent this way. They care about people and have a hard time turning someone down when they are truly in need. ENFJs are very capable people who can handle taking on many tasks at once, and so they strive to help others when they can. They don’t mind doing favors and might even enjoy being someone that others can turn to in these situations. INFPs don’t mind doing favors for people, especially the ones they love. They might not find themselves incapable of turning people down when the favor seems out of reach, but they will do their best with reasonable things. When the INFP cares for someone they definitely want to make them happy, and so they will enjoy doing favors for them. They want to have connections where they can be there for one another, and so for them doing a favor will feel natural and easy. ENFPs don’t mind doing favors for people, but they might jokingly ask for something in return. They are capable of turning someone down if the favor seems like something they just aren’t up for at the time. ENFPs don’t just bend to what other people want and sometimes they are too caught up in their own thoughts to focus on something else. While they can be a bit stubborn they will do a lot for the people they love, and the occasional favor for strangers as well. INTJs don’t really like doing favors, but prefer for things to be more productive than this. Just doing a favor for someone can be a bit useless, especially if that person does not learn from it. They are more than willing to help people, but they want to do this by teaching them how to take care of themselves. For the INTJ some favors are just enabling people to fail down the line, and so this isn’t something they want to do. INTJs will certainly do favors for people if it is someone they care for, and if that person will still learn something from it. ENTJs don’t mind helping people, but a favor can sometimes be a negative in their minds. Just doing something for another person with any sort of lesson learned, seems like they are enabling their bad behavior or failures. ENTJs want to help people learn how to take care of themselves and be more efficient in their own lives. They do their best to supportive and helpful, but not if it is only going to hurt that person down the line. For them it requires a bit more thought than just automatically doing someone a favor, and it depends entirely on what they are doing. INTPs don’t mind doing favors for people, especially for the ones they trust. Sometimes they can struggle to do favors for people they do not know, since they might feel like they are being taken advantage of. INTPs can be fearful that someone might be using them, and so sometimes they can be nervous to really commit to too many favors. INTPs are willing to help the ones they love though, and will certainly be open to doing favors for them without anything in return. ENTPs don’t mind doing favors for people, as long as it feels right for them. They are willing to help the ones they love, especially if they truly trust them. ENTPs care about being there for their loved ones and do want to make a difference in their lives. For them it depends entirely on the favor they are asked to do, and if it lines up with something they are comfortable with. ENTPs just don’t want to feel controlled or manipulated, and so they will only be willing to do favors for the people they trust. ISTJs don’t mind doing favors for their loved ones, but for strangers it can be challenging for them to really waste their energy. ISTJs are efficient people who spend a lot of their time working hard to improve their lives and take care of their loved ones. They don’t like expending too much time or energy on people they aren’t connected to, and so they might not be open to doing favors for just anyone. When it comes to their family they will often do a lot to take care of them. ESTJs are hardworking and efficient people who strive to get things done and provide for their families. While they will often do a lot for the people they love, they won’t do favors for just anyone. ESTJs can have a hard time trusting people and so they aren’t always comfortable just dishing out favors for people they don’t know well enough. They will often help their loved ones and do favors for them, but they want to be sure they aren’t enabling their bad behavior. ISFJs are certainly happy to do favors for people, even the ones they aren’t close to. They are people pleasers who will don’t like disappointing people or feeling like they have failed them. For the ISFJ doing favors for others is something that feels natural and is often something they enjoy. They are especially happy to do just about any favor for someone they love, especially if this action will make them happy or improve their lives in some way. ESFJs don’t mind doing favors and might even seek out ways to improve the lives of others. For them it feels natural to commit to doing favors for others, especially the people they love most. ESFJs are people pleasers who dislike doing anything that might let others down or disappoint them in some way. They strive to be someone who can help others and improve their lives and so doing favors for them is something that comes naturally for them. ISTPs don’t mind doing favors for people once in a while, especially for someone they love. They have boundaries though and are perfectly comfortable turning someone’s requests down. For the ISTP it depends on what they are doing in that moment and if helping someone out seems to make sense or fit into their current situation. They do like helping people, especially if their actions will teach someone something valuable. ISTPs are more likely to do favors for the people they love, since they can have a hard time opening to most people enough to really help them in this way. ESTPs will often do favors for their loved ones, and even enjoy being able to. They care for their loved ones and want to do just about anything to help improve their lives. For ESTPs is often depends on their current situation and their feelings, and they will be capable of helping them if it makes sense at the time. ESTPs won’t do favors for just anyone and they certainly won’t accept any favor request given to them. They are capable of turning people down since they have boundaries, and for the ESTP it depends on their current situation. ISFPs don’t mind doing favors for people, especially the ones they love deeply. For the ISFP it depends on their emotions in the current moment and what feels right for them. They will be willing to do favors for the people they are close to, especially if it will make that person happy. ISFPs follow their hearts and do what feels right in the moment, so for them it will entirely depend on what the favor is and what their current situation in life is. ESFPs care about their loved ones and so they will often do plenty of favors for them. For the ESFP it depends on the current situation and what feels right for them at the times. ESFPs want to help others and make their lives better, especially when it comes to their close loved ones. They will be willing to do plenty of favors for people, but it often depends on what is going on in that moment. If for some reason the favor feels wrong or like it shouldn’t be done, the ESFP won’t be afraid of taking a step back.